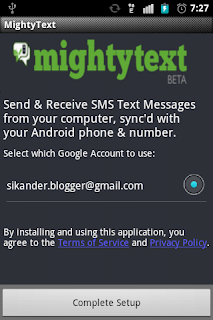 MightyText is a simple and free Android app and browser extension that lets you send and receive text messages from the PC via Chrome/Chromium. 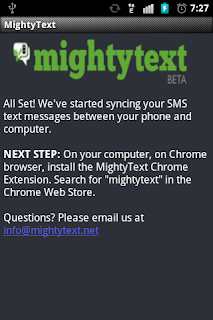 All you need is an Android phone with the MightyText app, Chrome/Chromium with the MightyText extension on your PC, and an active and reliable data connection on your smartphone. 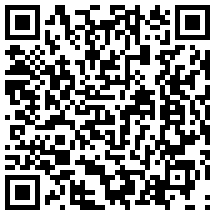 A Google account is also needed, but you probably already have one if you are using an Android phone. 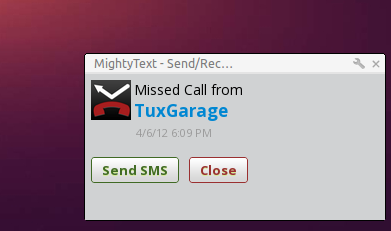 MightyText generates popup notifications on the PC for every new message and incoming/missed calls. You can read and reply to received text messages, and reject incoming calls with a text message. You can obviously compose new messages as well. If your contacts are stored online in Google Contacts, you can sync it with MightyText for easily accessing your phone book from the PC. The messages sent from your PC are routed through your phone, so the recipient sees you as the sender and not a random web address. A major benefit of MightyText is that you can use your PC's keyboard for typing text messages, which makes that very easy, compared to using your phone's virtual, or fiddly actual keyboard. You'll never miss a message/call just because you forgot your phone at home. From your office, where you might not be allowed to constantly use your phone, you can still keep communicating with whoever you want. 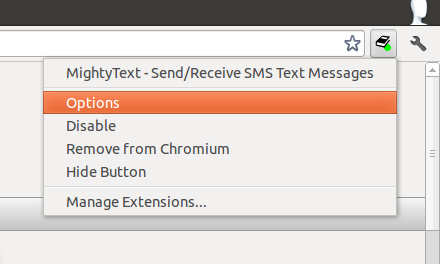 That said, the MightyText extension is only available for Chrome/Chromium till now, but a Firefox version is being worked on and might be available soon. They are also working on a web interface that you can access from anywhere. There are some other desktop to Android apps out there also, but they don't work as great as MightyText, because they are simply unreliable, or are paid apps. 2. 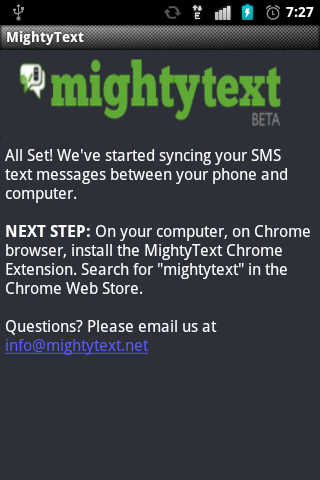 Once installed, open MightyText on your phone, choose which Google account you want to connect to MightyText and hit "Complete Setup". 3. Once it successfully registers your device, you'll see a confirmation. That's all that needs to be done from your phone. 5. 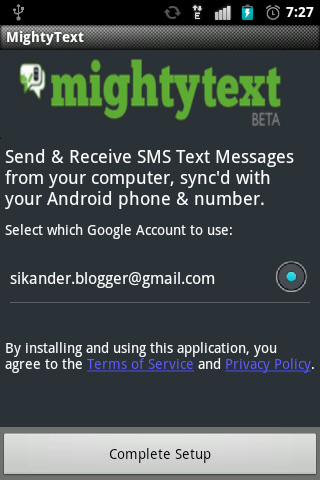 Sign in to MightyText using the same Google account that you are using on your Android phone. That's all, now you can start using MightyText!